High schoolers in Hoosick Falls say they are tired of the slow response by the adults in the community and government to a toxic substance that has infiltrated the village water system and made it unsafe to drink. They held a news conference Friday calling on Gov. Andrew Cuomo personally to act. 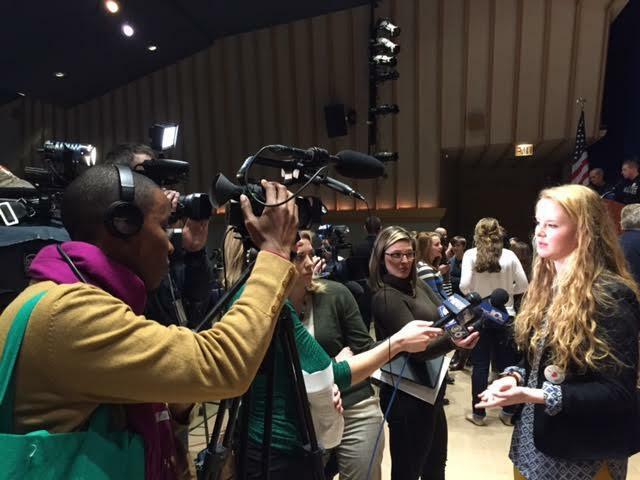 Hoosick Falls high school senior Anna Wysocki talks to the media Friday. The students, who delivered the presentation to the entire student body at the school’s auditorium, say town leaders and the state and federal governments have been too slow to respond to water contamination deemed by the EPA to be so serious that they are no longer allowed to drink, cook or bathe with it. And they called on Cuomo to act, saying the only acceptable solution is a new water source. The contaminant is a chemical known as PFOA, used in the making of Teflon, which has been linked to cancer and other illnesses. It is believed to have infiltrated the town’s water supply by leaking from factories now run by St. Gobain and Honeywell. The EPA declared the water unsafe to use last fall. Cuomo’s administration, after knowing about the potential problem for more than a year, in late January declared Hoosick Falls a Superfund site, and classified PFOA as a hazardous substance. But the students say that’s not enough. They know that simply declaring something a Superfund site does not necessarily bring a swift solution, and the designation does not address the needed filtration of the water, or finding a new water source. Cuomo, in his State of the State message four years ago, said he’d be the champion of all students in New York. “I am also going to be the student lobbyist,” Cuomo said on Jan. 4, 2012. The students say they take Cuomo at his word, and expect him to put money into his state budget to build a new water supply for the town within the next year. The water at the junior high school, which sits a mile out of town, has not been declared unsafe, but the students believe it’s only a matter of time before the chemicals seep into the groundwater. The state Department of Environmental Conservation on Thursday issued a cleanup consent order for St. Gobain and Honeywell, saying they are legally responsible for damage and remediation. Cuomo, though, has cautioned about drawing any conclusions until all the facts are known. “One of the things you have to watch in a situation like this, I think, is that emotion doesn’t get ahead of the facts,” Cuomo warned. The students took offense at those remarks. Jocelyn Harwood writes for the school newspaper. Hoosick Falls schools Superintendent Ken Facin, speaking as the students in grades 6 through 12 filed in for the assembly, says the children are understandably very concerned. “I think these kids are having a lot of anxiety over this issue,” said Facin. “This has really not been handled very well at any level,” he said. Facin, who has a degree in geology, says the assembly and news conference was entirely driven by the students, but he says he agrees with their conclusions that a new water source is needed. Wysocki, who says people close to her in the town have died from cancer over the years, says she and the others made up their minds to act after attending a Town Board meeting on Feb. 9. She says the last straw came when town officials opted to wait until they received a recommendation from the state health department before taking any action. She says what the students want is really very simple. The governor’s office did not immediately respond to the student’s requests. But Cuomo has characterized his response to the crisis as “aggressive,” saying the state is doing a second round of testing on wells, and blood tests of those potentially exposed. Students say if Cuomo does not come to them, they’ll come to Albany to visit him instead. It’s something most of us take for granted. You turn on the tap, fill a glass of water and have a nice refreshing drink. But what if that water has been deemed too contaminated to consume? 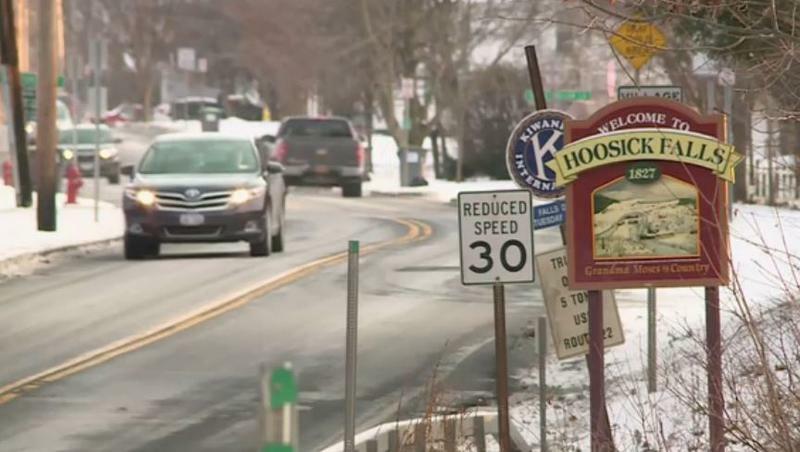 That’s something residents of the Rensselaer County village of Hoosick Falls are confronted with as they try to determine how to move forward and make their water drinkable again.